So who's ready for the blizzard of the month? I know I am! 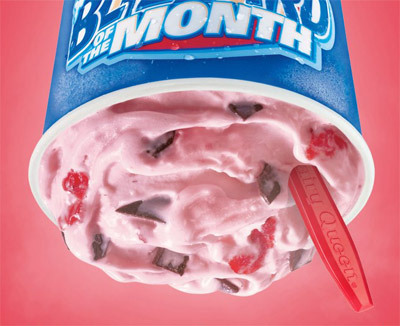 So I did a little searching because I don't remember ever seeing the Choco Covered Strawberry Blizzard before, but it's pretty straight forward and seems like something they would have done before. Well, it was on the list of the 25 blizzards for the 25th anniversary celebration, so it definitely existed. Digging further, I suspect it was also the blizzard of the month in December of 2010 (when I had no access to DQ which explains why I missed it). Now I've enjoyed both the strawberry golden oreo blizzard and the strawberry cheesequake blizzard, so I have no reason to assume that this won't be excellent. Let's find out! Today worked out to be a great day to take my daughter to DQ. I tried to convince her to try the oh so tasty treat you see before you, but she went with an Oreo blizzard. Oh well, she'll learn someday hehehehe. 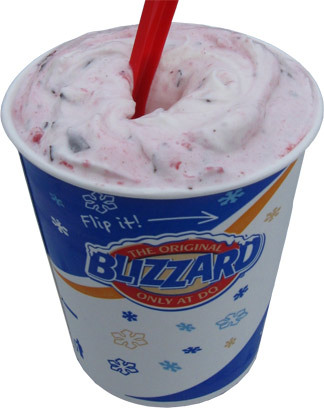 The thing I love about these strawberry blizzards is how the blender just obliterates all the strawberry chunks and sends the flavor everywhere. Mmmmmm, so very tasty. It's so so sweet and strawberry and it just always makes me happy. Ok, I've never been a big fan of the spoon shot, but you need to take a closer look at this one. Just look at how well the strawberry has gone everywhere. I'm such a sucker for a well spread out flavoring like this. The chips are nice too. DQ went with the real thin chips so you get that nice easy crunch (and non-overbearing) crunch. I don't know if DQ would be willing, but since this is suppose to be chocolate COVERED strawberry, I would love to see a nice handful of these chips on top. See, I got a bunch on the bottom and they left a wonderful finishing taste with me. However, had I gotten them to start, it would have really brought the name of the this blizzard to life. So, there ya have it, short and sweet. This one pretty much cements my love of strawberry blizzards and I wouldn't be surprised if we head back and grab another before the month is through.